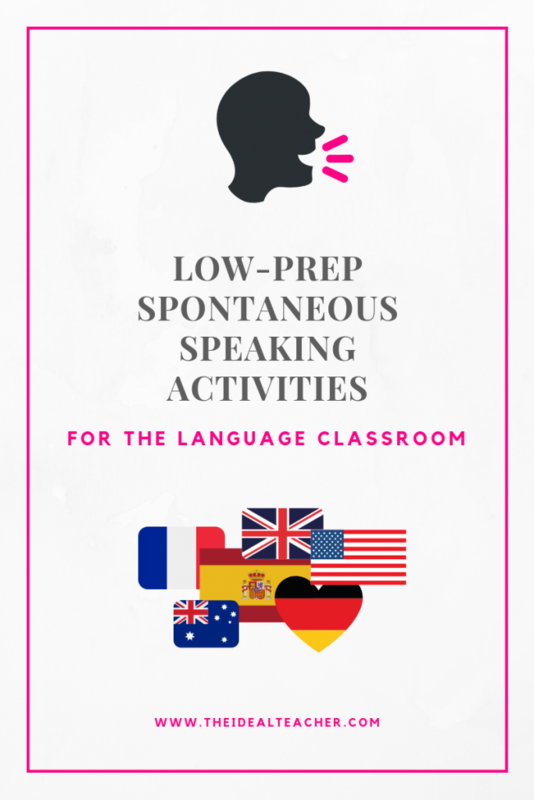 What speaking activities do you use in your classroom to practise spontaneous speaking? 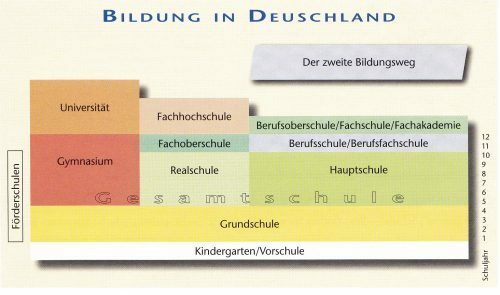 As you might know, I teach French, German and English which keeps me very busy! Although I teach many different groups of students, one common element is that the majority of students want to improve their spoken production of the language. This is a skill I have always found tricky to guide in the classroom, as I get carried away with teaching and practising all of the other skills. However, this year’s target was to develop this and it’s going well so far. In the past, I used lists of questions as speaking activities with one question after another printed (or projected) either on a Word document or from the text book. This method is fine now and again, but it can be rather dull. To add some variety to this spontaneous speaking activity, I also created 10 different sets of ‘Student A’ and ‘Student B’ questions on two pieces of card. This uses the same principle as a list of questions, but adds a little more intrigue. Although listing questions ‘does the job’; from personal experience, it can get quite repetitive. 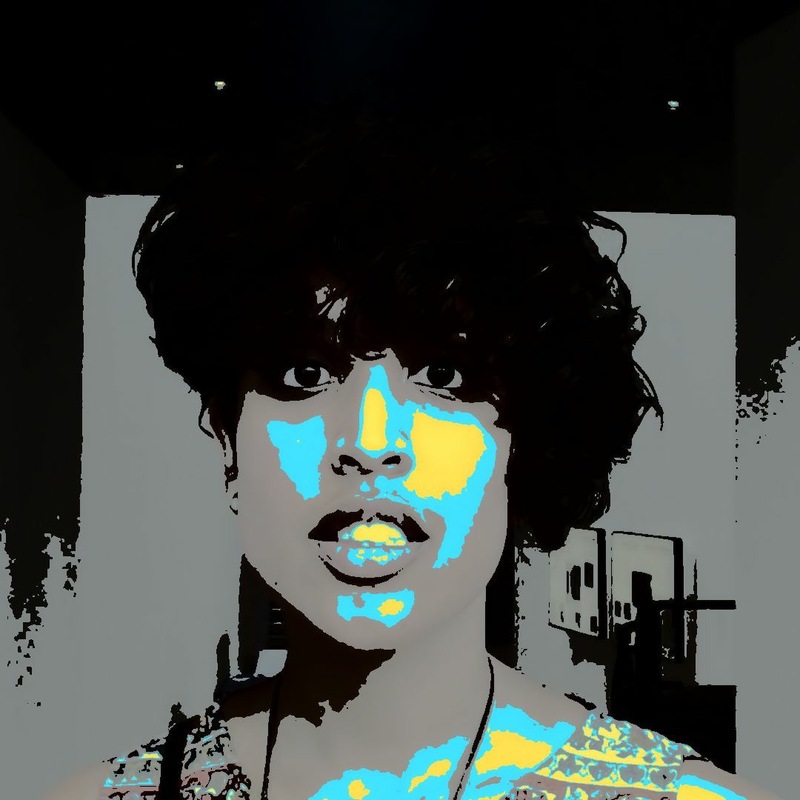 Therefore, I have put a list with some of my most used spontaneous speaking activities this year, which can be adapted for all languages. These spontaneous speaking ideas will definitely get your students speaking and will, hopefully, keep them focused, enthused and aid in building their spoken confidence and abilities. Instead of listing questions one after another on a word document, put them on an A4 sheet using speech bubbles. It looks a lot more attractive, it can be projected from a screen, or printed for students. The spontaneous speaking activity with speech bubbles can easily be edited by changing the text I have written. SPONTANEOUS SPEAKING SPEECH BUBBLES CHALLENGE: If you have more advanced students, you could get them to create the questions and write them in the speech bubbles around a topic of your (or their choice) and then get them to work in pairs for the speaking activity. I always ask students listening to speech to make a note of errors they spot and feedback at the end; this activity keeps the non-speaker busy, but also can help the speaker (if done well). Most students love a good sweet, so, providing the students don’t eat the Skittles before the activity, this is a brilliant idea! If you have the budget and want to provide students with authentic sweets, you could buy Skittles from a local convenience store or supermarket. Alternatively, you could print some circles with ‘S’ in red, purple, yellow, green and orange and laminate them to re-use. 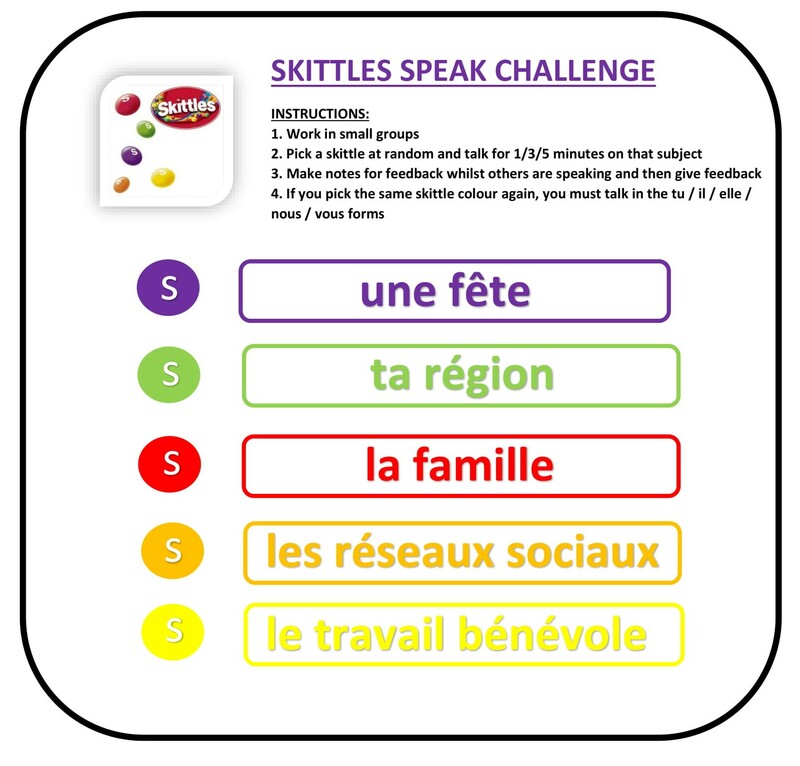 Choose topics for each Skittle flavour and assign them to a corresponding colour. Students choose the Skittle at random and must speak for 1, 3 or 5 minutes on that topic. 1 point per minute spoken, hesitations and repetition lose a mark! 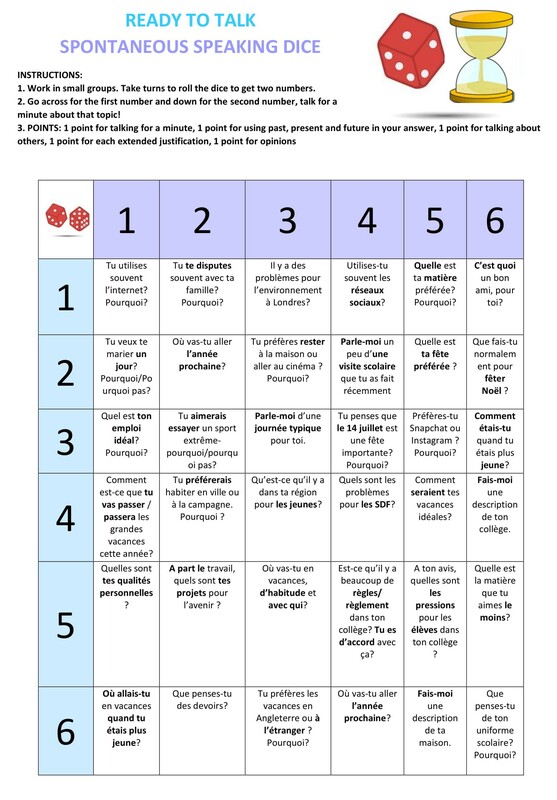 Here’s one I used with Year 11 French as a revision activity, which you can easily adapt and duplicate. 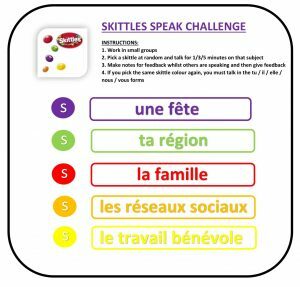 You could also check out my recent ‘Spontaneous Speaking Activity – Teaching Tip Of The Week‘ for a twist on the traditional Skittles speaking game, as well as an explanation and a great downloadable PowerPoint resource to use in your classroom. You can buy a beach ball for less than £2, inflate it and write questions on it with numbers using a semi-permanent marker pen . Throw the ball around the classroom, or around a small group of students along with some music in the target language in the background. 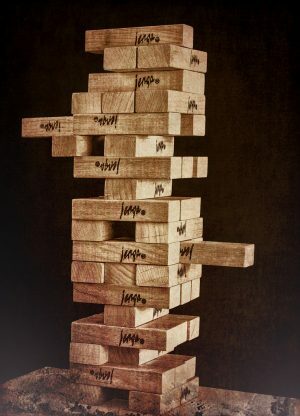 Check out these posts for 45 German songs and 45 French Songs organised by theme to play in the background. Whoever has the beach ball when the music stops must answer a question. The last person to answer can choose a random number for the question, or you can use Google’s Random Number Generator (just type it into the Google search bar). If you have the budget, try using some talking dice. 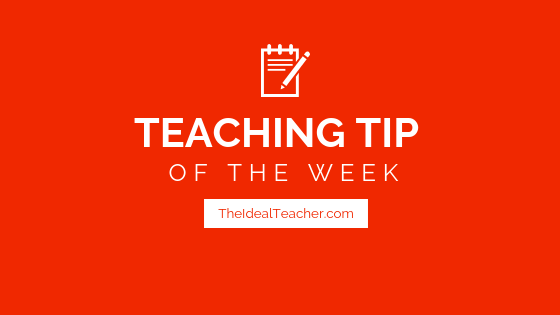 which students can use in small groups to speak spontaneously on a set topic or for a set amount of time. 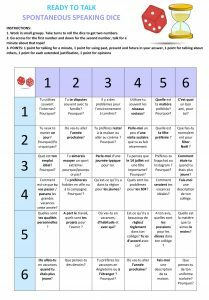 If you don’t have the budget, or would prefer a different form of this speaking activity, then why not adapt the board in the ‘Ready To Talk’ Spontaneous Speaking Dice handout below? Students will need to roll a dice to get two numbers in order to answer a question. 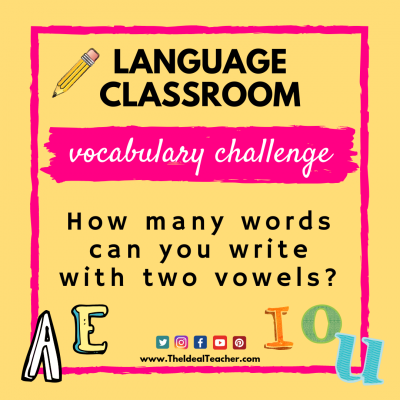 A variation on this activity includes creating sentences based on subjects (I/you/he/she/it/we/you/they, which are given a number 1-6), as well as a theme (which are also given the numbers 1-6). I love dice. If you haven’t got any for your classroom yet, I strongly recommend them for spontaneous speaking activities! You can get a variety of colours in this set of 30 dice for under £4 (as of 7th Nov 2018). Adults and children alike love a good board game! 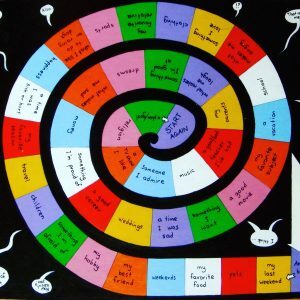 I have shared some of my favourites recently, including the colourful spiral board game with random topics, such as ‘a time I was ill’, ‘travel’ and ‘a good movie’ which allows students to be creative in what they are saying. 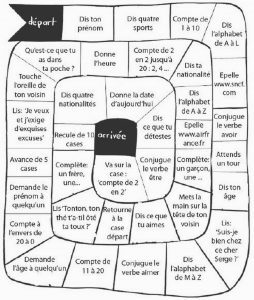 You can also use present this in a similar way to the black and white French board game pictured. All of these are relatively easy to make and adaptable for every single topic, level and language you can think of! If someone’s underwear was showing, …. 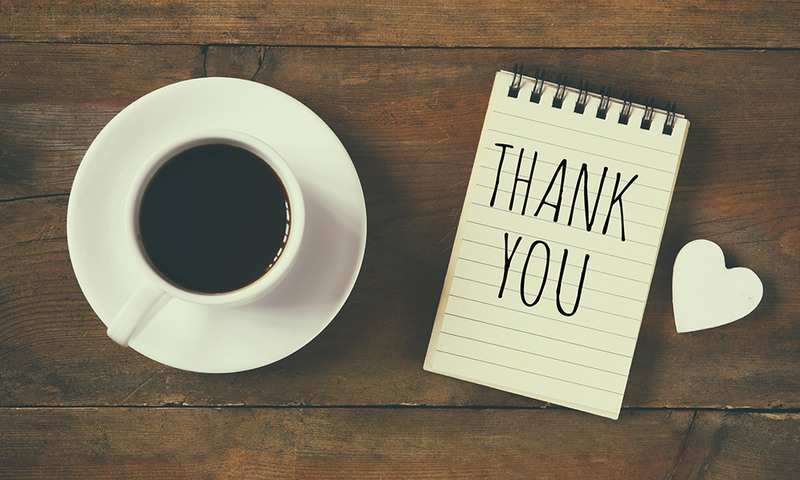 If the whole world was listening, …. Students can get very creative with these sentence starters if you let them! 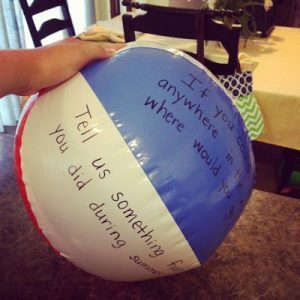 To make this spontaneous speaking activity a no-prep activity, get students to create their own sentence starters and pass them to another student to complete. Spontaneous speaking can definitely get boring if you just provide lists of questions. Hearing my students speak using these speaking activities and have fun doing it really gives me pleasure. I hope the list of my top 6 spontaneous speaking activities allows your students to speak and give you time to move around the classroom providing feedback. Like what you’ve read? Why not join TheIdealTeacher.com’s exclusive mailing list below to keep up-to-date with all of my latest content, including fab teaching ideas and activities!